The ridership numbers for January are available and they’ve got a lot in common with the December results. Overall ridership was up 6.6% on January last year, although there was an extra working day this year. That growth is all coming from buses though as both rail and ferries saw the number of trips decrease. Thankfully the buses, and especially the Northern Busway, continues to chug along with double digit growth. 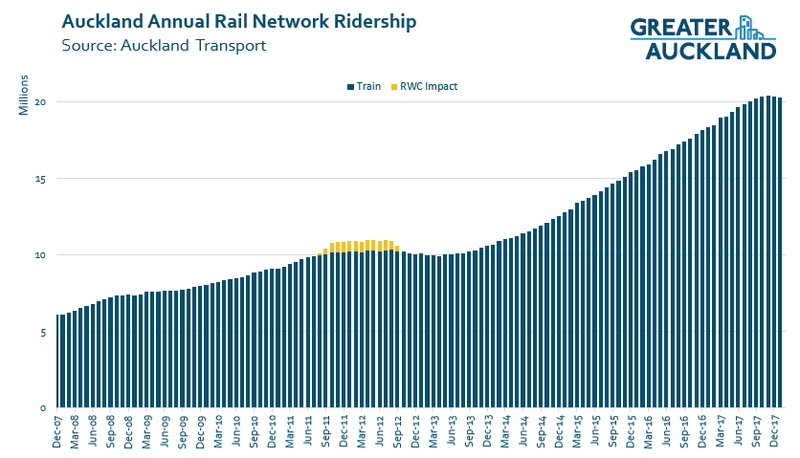 This is the second month in a row that rail use has dropped compared to the year before. Like in December, there are logical and explainable reasons for the drop, nonetheless it is a trend we hope doesn’t set in. The main reason for the drop in January was the Christmas/New Year shutdown. ATs figures show that the Western and Onehunga Lines were the most heavily affected. The Southern Line was less affected because many people could still use the Eastern Line, which saw good growth. February will hopefully return us to growth because with the recent industrial action and fewer working days, March is likely to drop too. What is less clear is why ferries were down almost 7% (over 9% after accounting for the extra day). Both the contracted (AT subsidised) and exempt (fully commercial – Devonport and Waiheke) routes were down. Some of will have come from the storm in the first few days of the month but surely not all of it. 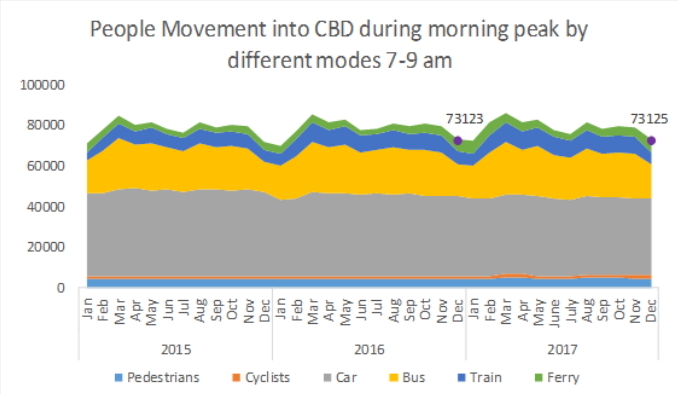 As part of the monitoring that AT are doing for the City Rail Link, for some time they have included a chart in their business report on how people get to the city. This is shown below and while it may be a technically accurate chart, it’s hard to actually derive any real value from it. So, I asked AT for the data behind it and it threw up some interesting results. First, I changed the results from monthly to a rolling 12 month. I then group all the PT modes together and Walking and Cycling too. As you can see, when you separate out the modes that cars are dropping remarkably. In just two years, the percentage of people arriving in the city by car has dropped below 50%. That trend is only going to continue as the city keeps growing. January this year was incredibly wet and windy, with repeated easterly storms. The ferry was closed multiple times and walking in Auckland is just awful when it’s 28 degrees and bucketing with rain. This won’t have helped rail, bus, or (especially) ferry numbers. Hopefully this isn’t part of a larger change, but I think that we may need to wait until the April and May figures are out before we can get a better grasp of that. Interestingly, from the AT chart, it is clear that the Christmas trough and March peak barely touch the car statistics. Thus proving that people are actually smart enough to not turn to a car in extraordinary circumstances. This gives me great hope, as does the general downward trend in car entries on your graph. – Dec had 1 less working day and a strike. Do you think it has anything to do with reaching current capacity? I know that the Western Line is still using three car trains for some services during peak periods and these are typically very overcrowded. It could be turning people off using the train? Good analysis Matt. 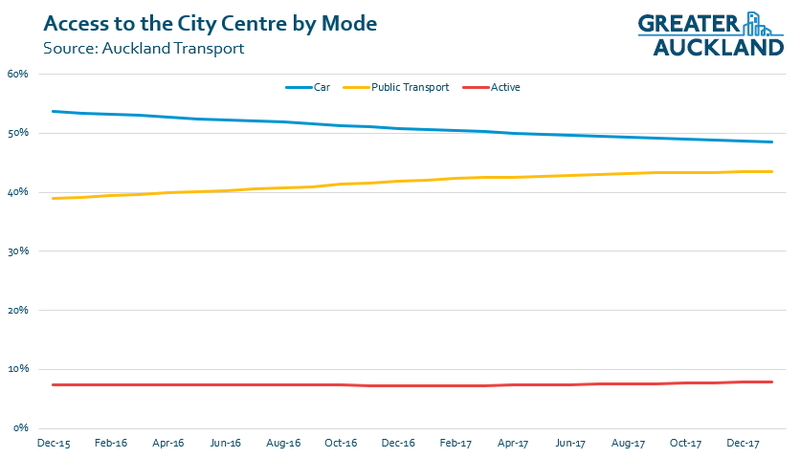 Might be worth plotting rolling 12month total number of people accessing city centre. Good to understand how total mobility is changing along with mode share. Oh and just to clarify: the screenline data relates only to 7-9am. So overall mode share for car access to city centre may well be higher than that shown here. Be interesting to get a 24 hr screenline survey going at some point just to understand overall patterns rather than just am peak. Are they counting trips not journeys – so could the rollout of New Network with more segmented trips be skewing things ? The electrification boom has happened, everyone that is going to move over already had. Getting the feeling that there’s not a huge amount of peak time capacity on the trains. The britomart tunnel is a choke point. I rather enjoyed the recent industrial action, yes frequency was down, but the average journey times was much improved. The next gains will be made by improving off peak; frequency is poor and finishes far too early. The next big gains come when the Eastern Busway opens, feeding huge passenger numbers onto the eastern line. The CRL will deliver a large boost as well. Need an updated busway ridership chart with actual rolidership compared to business plan. Needs to be pinned to a wall somewhere in the AT headquarters as a reminder of how bad their PT demand modelling is. To what degree are forecast models influenced by outdated MoT and NZTA assumptions you HAVE to use if you want to get co-funding? Serious question and rhetorical question both. No assumptions that you have to use, but you can obviously be challenged in peer review so perhaps the bigger risk is that realistic predictions don’t get through peer review. Shouldn’t a range of predictions be assessed? I would have thought a deterministic growth forecast would be hard to defend? You typically use a range for sensitivity testing. The dumbest part for large scale PT projects is that you usually have to assume the exact same travel demands no matter what you build. You don’t have to assume the same demand across options, but the way the system works, is it is easier if you do. The problem with variable demand is that new trips only have have the benefit of existing trips. So you need to be able to separate them out and apply different values to them. Then you need to be able to show the effect of your demand assumption, so they will make you do it with the same numbers anyway. So your choice is do it two ways or just do it one way. AT increase the price of PT, so it reduces the demand. Rail growth has hit the plateau. It will require further improvement in service such as frequency and journey speed to lift riderships. We need to push for the new timetable ASAP as well as making sure the new timetable makes significant difference, not just some trivial few seconds faster. Yes think this is a lot of it. I think wild weather has big impacts on all the active/PT modes & generally people just wanting to go out at all even in cars. This certainly would of affected ferries. Also the hot weather & people less dressed added to the odour smell in trains wouldn’t help- comments to this affect on this blog a few weeks back..but that may have been more a Feb thing. Rail needs to sort out the dwell time issues and the ETCS issues artificially keeping train speeds slow. Between them we could probably improve journey times across the rail network by 10% or more. Benefits of this of course would be faster journey times for passengers, lower wage costs/better productivity, better utilisation of trains meaning extra services can be operated with the same number of trains meaning more capacity and better frequency. The other issues of course are the lack of frequency improvements to peak but especially to offpeak services. Offpeak is where we are going to get bigger gains right now (but will also improve peak patronage if people know there will be an offpeak service on their return journey). Lets hope so because the Auckland Plan says 27% by 2046. That’s not ambitious, but more of that later. Let’s take an example: of what might be happening: say 100,000 people come into the city every day and 50,000 (i.e. 50%) of those come by car. If AT grows the public transport number by 7.5% (averaging bus and train) then there are 103,750 trips coming into the city each day. This means that the number of cars coming into the city can now be up to 53,750 per day and the proportion of cars coming into the city is still 50%. So a measurement of this nature is nonsense. The more PT usage grows the greater the number of cars will be possible without increasing the percentage. And as PT grows off a larger and larger base so the number of cars can swell. AT says that the proportion of car traffic to the city has not increased any in the last five years. That’s a real concern given the high double digit growth for PT of recent years. Matt, I know that you and I have disagreed on this point in the past, but this equation is the very reason that the city needs a congestion charge. Congestion, based on the current lack of progress by AT will continue to grow. There are no major incentives to change the number of people driving cars. AT with their current car parking policy, or more likely the poor implementation of it, provide no disincentive to drive. (I dislike using anecdotal evidence but an example from today is illustrative – one of my clients paid $52 for 4 hours at a Wilsons Park. Cost at an AT park $16). Some might say that the Wilson’s price is excessive, I say its the market. As a ratepayer I am appalled that I am subsidising every single person who uses a Council car park. I am further concerned because, due to their low prices they generate very little spare revenue to use elsewhere. The new petrol tax is a joke to try to discourage many trips to the city. Take a person travelling from Herne Bay to mid Queen St – 4 kms. So they travel 40km per week to work. Say their car uses 8l/100 km. So they use 3.2l per week. That’s an extra 12.5 cents x 3.2 = 40 cents per week. If that journey is a one zone fare a bus passenger is paying an extra 50 cents per week due to the fare rises this year. If this is all that’s going to be done to ease city congestion someones taking the urine. AT clearly don’t have the money, or it seems the will to provide the carrot to induce better PT usage to the city, so let’s have the stick to do it. I suspect the best AT will manage is a toothpick and it’s likely to be bent at that. In two years time a single project, that is the Convention centre, will increase daily traffic by up to 3500 cars per day. On current progress AT will loose the battle to solve congestion in the city. The real kicker is that unless AT can reduce congestion they will feel less inclined to introduce bike lanes and bus lanes as space simply won’t permit it. +1 This is why congestion charging will be an enabler of PT and cycling improvements. We can’t tax congestion away – it just can’t work unless there are alternatives. That means fast, frequent, widely available and inexpensive public transport for all of Auckland. As you point out, AT and the Council don’t seem to have the will to deliver this. For most people, driving in private vehicles remains the only timely way to get around the city, so it’s no wonder that we have seen our vehicle fleet expand by 25% in only five years. Of course the more vehicles the Council forces onto our roads, the more congested they get and the less room is available for cycling and public transport. Things need to change, big time, because this Council is taking us backwards fast. 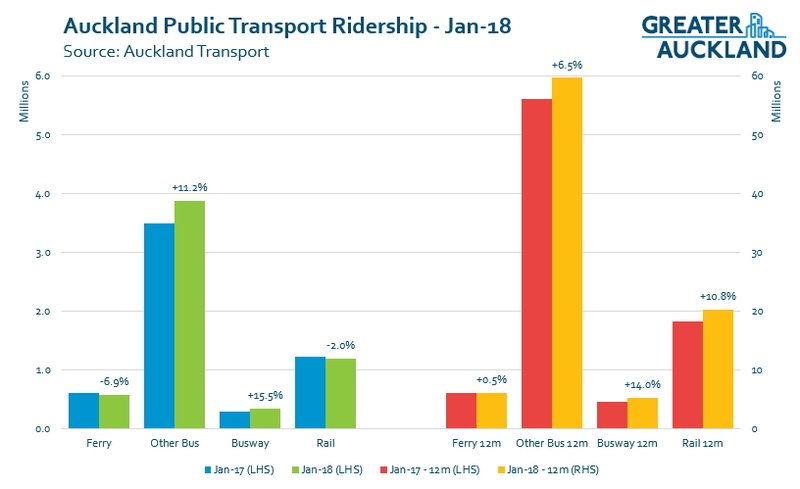 Figures that I have obtained under an OIA request predict that within Auckland trips will increase by 25% over the next 30 years. (ART prediction) That is more encouraging than the last five years, but I suspect that this prediction in no way mirrors what AT is currently doing or not doing. For example, looking at Takapuna figures from an OIA request shows the Takapuna mode share on ART prediction to be 59%. AT have already said, we can’t do that and their prediction is 75%. I suspect that they will make the achievement of this target self fulfilling by projects such as the 450 space car park building in central Takapuna. I suspect that the policies of this Labour led Council may be causing significant disquiet for the government. Remember that Jacinda’s two major goals are the reduction of child poverty and reducing climate change – 25% more trips won’t help achieve that.